Sarah graduated from Oberlin College with high honors in Politics in 2013. Her studies focused on the Middle East, and included six months spent in Jordan and the West Bank, studying Arabic and working with a refugee services NGO. She spent the last three years working for Albright Stonebridge Group, an international business strategy consulting firm based in Washington DC. As a member of the firm's India/South Asia Practice, she advised clients on market entry, stakeholder management, government relations, and political risk in the region. She also managed the firm's internship program. 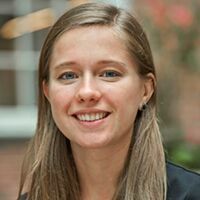 At NYU, Sarah hopes to study the influence of private sector interests on governance in developing countries. IILJ Scholars receive carefully tailored individualized mentoring and opportunities and work closely with the Law School's permanent and global faculty members in international law on joint research projects.